Journalism student Erik Erickson writes about the documentary “Welcome to Unity,” which pre-screened at the HUB earlier this month. UW students and staff received a sneak preview of the documentary “Welcome to Unity” Thursday Oct. 2 as the film, which highlights the lives of seven exchange students in a small rural town in Oregon, gets ready to debut at the Chicago International Children’s Film Festival at the end of the month. Producers Pete Ryan and Katharine Mahalic have organized screenings across the country to build momentum and raise funds for the final version of the film, which will debut on Oct. 24. The seven students take part in everything from eight-man football, homecoming, prom, and graduation at a school that graduated just seven students in 2008 and rarely reaches more than 100 students. The two producers partnered with FIUTS (Foundation for International Understanding Through Students), which helps integrate international students into the community at the UW, to raise awareness for the film. FIUTS is also organizing two more viewings of the film, at Chief Sealth High School in Seattle on Nov. 7, and at Eastside Prep in Sammamish on Nov. 14. Thursday’s showing was met with positive reaction as multiple students shared their thoughts on the 93-minute film and shared their own similar experiences. “Thank you so much for putting together this film and bringing it to the UW,” one student said to Ryan and Mahalic after the film. 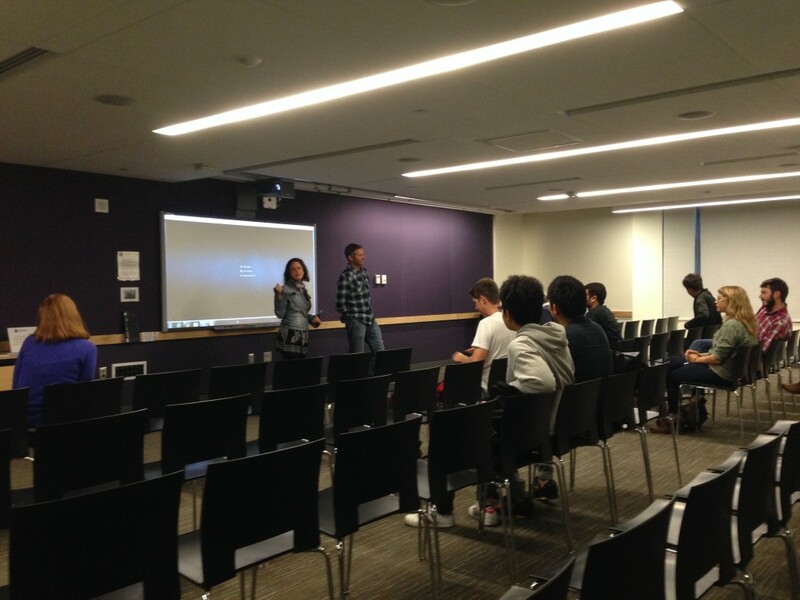 The film drew exceptional reaction from international students at the viewing, who were able to relate to highs and lows of living and going to school in the U.S.
Shuhei Yamaguchi, a graduate of Kumamoto University in Nagasaki, Japan, who now lives with a host family in Seattle, was easily drawn in and connected to the film. After being afraid to speak English, Yamaguchi now has a new confidence with his second language. “Now I’d really like to talk more with my host family, and my other roommates from China,” Yamaguchi said after the film. After a failed Kickstarter campaign attempt in May, Ryan and Mahalic hope their newly generated momentum will help their crowdfunding effort on the second go-around. The producers hope to run multiple smaller campaigns with amounts ranging from $3,000 to $5,000, instead of the $30,000 one-time goal set back in June. Money raised from crowdsourcing will help pay for music licensing, the final expense before the film festival later this month. Additional information about the documentary can be found on the film’s Facebook page and Twitter account. Erik Erickson is a News Lab student at the University of Washington.